After a many month gestation period and a ridiculously long labor our new hollywoodpiano.com is live! Since our web people are now adjusting, fixing links, trying to get it all working correctly on the host, etc, we ask your patience over the next few days. Also we ask your help as the site has been re-configured, re-paginated and as content has been inserted and retyped, we know that typos have been created during that process and we are spotting them ans fixing. If you see one, please let us know at info@hollywoodpiano.com. We really appreciate your help as we fine tune this very large site from the developer's host to our official home host. 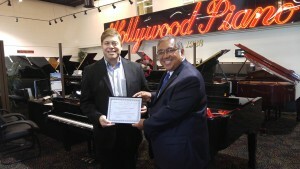 2nd Year In A Row Hollywood Piano Is Baldwin Piano's largest dealer in the USA. Burbank, CA -- (ReleaseWire) -- 05/04/2016 --Hollywood Piano's was honored today with the official presentation of the Baldwin "Dealer Of The Year" award from the Southern California Baldwin District Manager Herschel Green. This marks the second year in a row the Burbank based chain has received this award for outstanding sales. Hollywood Piano is one of the longest standing Baldwin dealerships in the country having started with them in the late 1930's. Glenn Treibitz, Hollywood Piano owner said, "Baldwin pianos sell themselves. When someone has been auditioning other brands and then sits down at a Baldwin it's like an "ah-ha" moment. We are proud to represent them." As the Los Angeles area's oldest continuing large piano retailer Hollywood Piano has been a key fixture in the music, television and the film industry since 1928. Some of the most celebrated pianos in screen history were either sold or rented to the studios by the company. These include the famous Casablanca pianos, the pianos used on "I Love Lucy", "All In The Family" and "Frasier" to name only a few. The Baldwin Piano Company is one of America's oldest piano makers and today is a division of Gibson Brands the parent of Gibson Guitars. It is known as America's favorite piano. In 8 short years Baldwin has successfully moved the manufacturing of their time honored uprights designs to their own factory in China. Improved versions of their Acrosonic, Hamilton Studio, 248 Upright and Concert Verticals are being applauded by pianists worldwide. With Gibson's famous attention to detail they are able to make the most reliable, consistent and musically excellent Baldwin pianos since the middle of the last century. Hollywood Piano is Mason & Hamlin's "Dealer Of The Year"
pianos the old fashioned way, by hand. 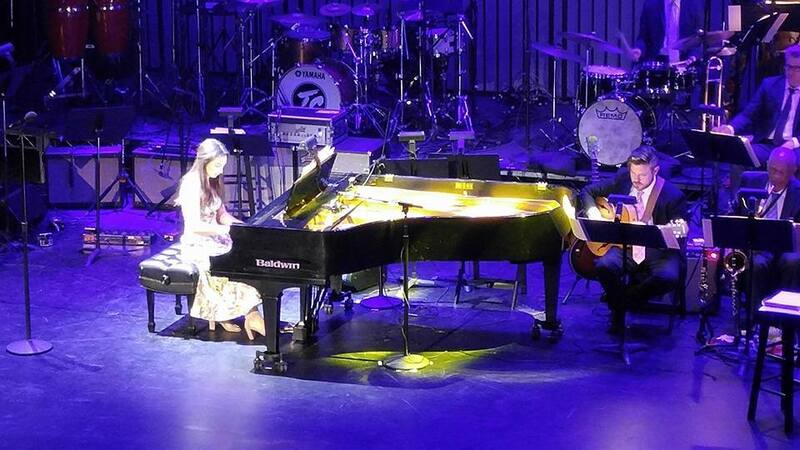 Yet Mason & Hamlin embraces some of the most cutting edge technology into their WNG piano actions. These actions are internationally celebrated for their durability and precision. While Mason & Hamlin is not inexpensive it just may be the finest value in the world of hand built pianos compared to other brands made in the USA and Europe which in many cases are not as well made but cost far more. Hollywood Piano is one of the nation's most respected piano retailers. Respected for a commitment to customer satisfaction providing award winning, industry leading procedures and warranties. These among many other things have brought Hollywood Piano recognition from the National Association Of Music Merchants (NAMM) being singled out as a "Top 100" music merchant. 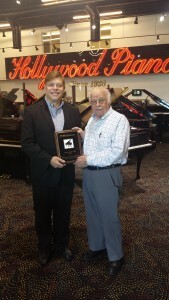 Hollywood Piano was the only piano company on the West Coast to receive this prestigious honor. Glenn Treibitz of Hollywood Piano takes a very personal hands on approach to the preparation of every Mason & Hamlin the company sells where every instrument needs his seal of approval. If you've never auditioned a Mason & Hamlin piano, you owe it to yourself to do so! 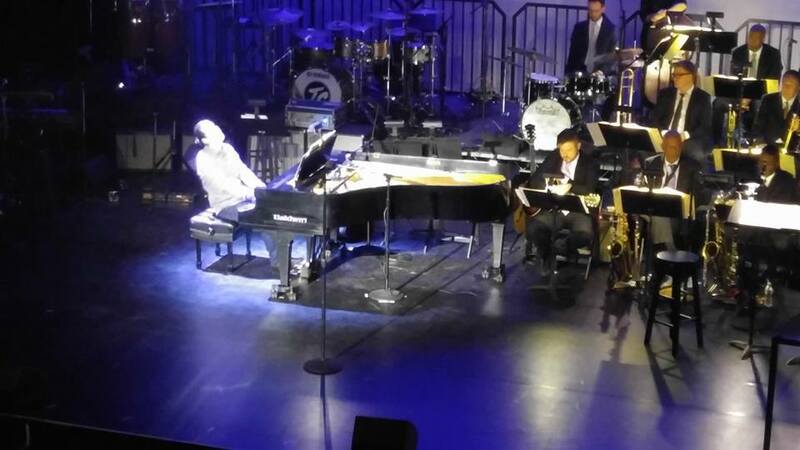 Hollywood Piano's Baldwin wasfront and center at Saturday night's star studded event featuring Patti Austin, Siedah Garret, John Clayton, Ricky Minor among many others all honoring the amazing 83 year young Quincy Jones for the LA Jazz Society's Lifetime Acheivement Awatd. 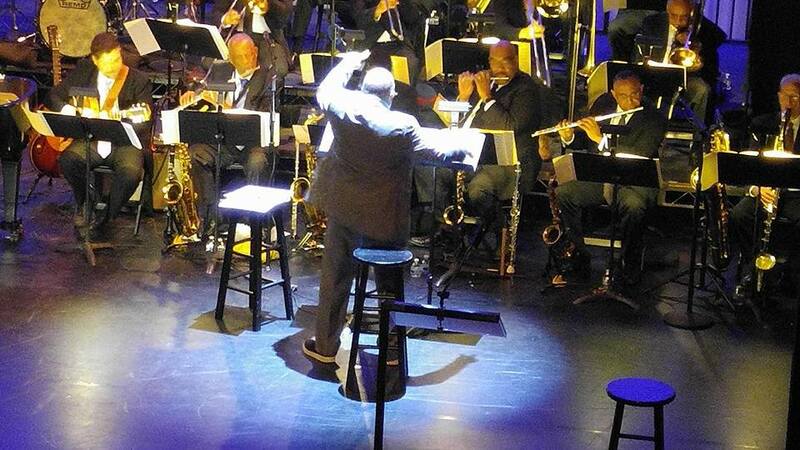 Pictured at the Baldwin are our friend, Emily Bear and the incredible Alfredo Rodriguez. In his acceptance speech Quincy acknowledged the election and said he knew some people were angry and offered this quote from Mark Twain. "Anger is an acid that can do more harm to the vessel in which it is stored than to anything on which it is poured. " 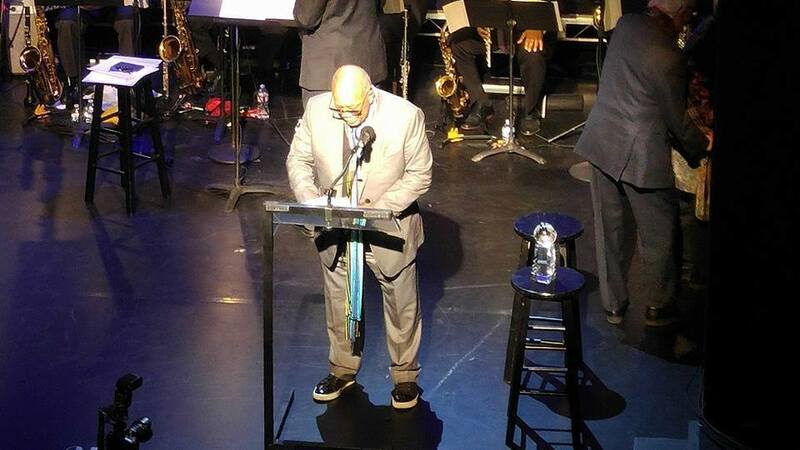 At the end of the evening Quincy took the podium and conducted his famous "Soul Boss Nova' . It doesn't get any better than that.